This dark and moody styled shoot is the perfect blend of boho mixed with edgy industrial styling. The aim of the stylists was to show that these two can marry together, let’s take a look at the result. The bride was wearing two different wedding dresses, a boho chic yet modern one with a cutout back and lace inserts and a romantic lace midi wedding dress with long sleeves and a V-cut. She showed off several headpieces with rhinestones, lace and beads. She changed waves and a messy wavy updo to match her dresses and headpieces. The wedding stationery was mid-century modern, with gold foil. The wedding backdrop paired two trends in one: geometry and macramé. It was a large copper tube hexagon with a macramé hanging, and you may also see dried herbs, florals and pampas grass. There were mismatching wooden and Moroccan print chargers and bold purple napkins. The wedding reception was a truly boho one, done with a low table and colorful Moroccan pillows for sitting. The runners were colorful and macramé ones, there were colorful candles and a lush yet moody floral centerpiece with dried herbs, and the vase was covered up with macramé. The wedding cake was a large one, with a burgundy, pink, white tier and some broken pink shards on the topper layer plus edible macramé. 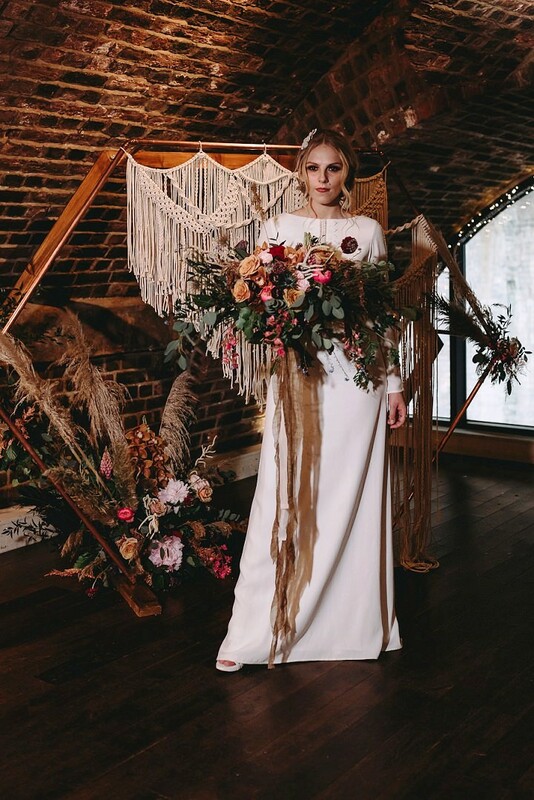 The post Perfectly Styled Boho Industrial Wedding Shoot appeared first on Weddingomania.